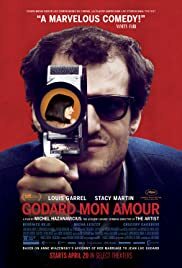 The film GODARD MON AMOUR (American title) /LE REDOUBTABLE (French title) that premiered in Cannes last year, a loose chapter in the biography of Nouvelle Vague director Jean-Luc Godard and directed by Michel Hazanavicius who made THE ARTIST is one anticipated by many especially cineastes. During the making of one of his films, French film director Jean-Luc Godard (Louis GarreL) falls in love with 17-year old actress Anne Wiazemsky (Stacy Martin) and later marries her. The film is shot in the style of many Godard films – the way and mannerisms the characters speak, the large word title, the colourful huge lettering, clothes and so on. In the film Godard is shown to be quite the oddball occasional jerk when he is on his politics activist side. Anne, in one scene claims she married Godard the film director not the activist. It is clear what Anne thinks, as the film is adapted from her novel “Un an après”. Anne dislikes any political activism. This is emphasized in a street demonstration scene when a activist/marcher Jean-Jock laughs at a film critic/director that his film is to be played at Cannes. “With what is going on, who is going to Cannes?”, he remarks and laughs controllably. Not much else needs to be said as it is clear that Jean-Jock is the total idiot. Films, as everybody knows can influence what people think, hence any political activity can be affected by film. Though the film might look trivial on the surface, there is much going on that can be read between the lines. This is a chapter of the life of Godard as seen from Anne’s point of view, not a biography of Godard. Nothing is mentioned of his early life, background or life. But the film does illustrate Godard’s need to be politically involved, perhaps he has the need to feel important that he can make a difference. The Godard character does not like films, thinking that they are trivial. Even when activists criticize him and his movies, Godard takes their side. Godard has to decide to be a filmmaker or a revolutionist. He tries both and fails. 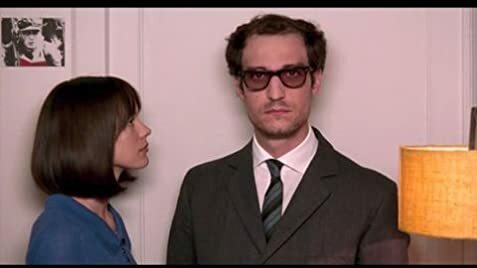 Hazanavicius film on Godard will obviously be frustrating as it is unclear his aim of making it. Hazanavicius shoots with the occasional humour of his OSS 117 and THE ARTIST though the humour is much less. Louis Garrel (THE DREAMERS) does an almost perfect Godard, capturing all his mannerisms and quirkiness. Hazanavicius’s wife Bérénice Bejo has a supporting role as Godard’s friend. It is simply hilarious Godard moves throughout the film annoyed, bewildered and manipulated by the activists. He is also shown as an insensitive and rude person while always being an oddball. One feels the urge to punch Godard right in the face at any time. The film did not earn a high approval rating, likely because of high expectations, but the film may turn out to be an entertaining, light and trivial tribute to an arguably great director of the Nouvelle Vague. On the other hand, one might end up hating this film thinking that Hazanavicius could have done a more serious piece with more insight on Godard. It would be interesting to hear what Godard himself thinks of this film. Those that know Cédric Kahn will definitely remember his excellent 2004 directed suspense drama FEUX ROUGE (RED LIGHTS) which he also co-wrote. The story concerns the marriage breakdown of a mediocre salesman Antoine (Jean-Pierre Darroussin) and his attractive, successful and increasingly aloof wife, Hélène (Carole Bouquet), as they are en route to pick up their daughter from camp, bickering as usual. The broken relationship is seen from the backdrop of her sudden disappearance when she decides to take the train. Kahn leaves the director’s chair to play the husband in this equally absorbing broken marriage story of Boris (Cédric Kahn) and Marie (Bérénice Bejo). Though the background is different, both films have similarities and are both equally a difficult watch. The couples have seen their love gone sour and both try to give it a second chance. In this film, the couple have decided to separate after 15 years together. They have two girls that they adore, but tensions rise as cash-strapped Boris continues to live in the family home. Neither of the two is willing to compromise, making their apartment a war zone. Sexual and emotional tensions remain high. An example is when the Boris accidentally enters the bathroom while Marie is having a bath. He claims that he did not see her inside and just getting his toothbrush. When she is angry he replies that he has seen her naked before. These are words and incidents that will eventually happen, regardless whether by a accident or not and will always lead to confrontation and uneasiness. The scene is done from the point of view of Marie, the camera focused on her expressions while she lies in the bath when the dialogue goes on between the couple. Lafosse takes no sides. The audience sees the irrationality of both the husband and wife and how emotions blur their better judgement. At one point, they scream uncontrollably in front of their two daughters. The scene in which they both eventually sit down as a family and the parents promise their daughters never to shout at each other is a touching one. One would imagine that watching a film on this topic be a brutal one. Surprisingly it is not, because Lafosse makes what appears on screen incredibly real than theatrically brutal. The sensitive and humanistic sides are also shown. Kahn and Bejo, especially are excellent in their roles. But all is not hate. In one sensitive and brilliant moment, Lafosse demonstrates that the love the couple once felt for each other was present in the past and not forgotten. “I did really love him” says Marie to her friends one evening party before Boris shows up and creates emotional havoc. The one unexpected visit by Marie turns out to be an evening of family warmth with the father and two daughters dancing together, edged on by the mother. Lafosse leads his remarkable AFTER LOVE to its obvious ending as Boris and Marie eventually separate but for the better.